Called to the principal’s office, Jeremy and Marty learn their school has been broken into and vandalized—including spray painted threats on their lives. Suspicion falls on Bruno Bashore, Marty’s step-father, who recently escaped from a mental health facility. He admitted murdering Marty’s mother in Book One—As Life Goes On. After four year old Bobby gets kidnapped, Jeremy calls in his ghost buddy Scott for help. Scott’s spirit world mentor allows him to come back to help Jeremy solve other problems—girls, a suspicious work accident that left his dad in a coma, the disappearance of Marty, and Bruno’s plan to murder the boys. This is the second book about high schooler Jeremy as the main character, with his living pal Marty and his deceased pal Scott (and Scott's dog, Mooshy). I thought it was a good continuation of the story that began in book one of the series ("As Life Goes On"). A third book is on the way. As with the first book, I thought some of the situations were a little too rough and some of the descriptions a little too graphic for teenage readers--I had assumed that younger teenagers (13-16), especially teenage boys, were the target audience for these books. But from a conversation I had with the author today he sees these books as books about kids that are written for adults. That puts a different perspective on things. I think if you picked this book up first and had not read "As Life Goes On," you would probably be confused about the characters and the story, so I definitely recommend, if you are considering this book, that you first read "As Life Goes On" if you have not already done so. I enjoyed the book. I finished it in just a few days, so it held my interest. The author has a good sense of humor that especially shines through in some of Jeremy's wry comments. The descriptions of high school life, the details concerning wrestling (Jeremy and Marty are wrestlers), the after-prom party that features some surprise guests--all were highlights for me. Because Jeremy gets into some trouble, the author is able to subtly teach any teenagers who do read the book how to stay out of trouble, which is a good thing. Moms and Dads can read the book and, if they're comfortable doing so, pass it along to their teenagers and use the situations Jeremy gets into as good conversation starters to explore serious issues with their kids as they discuss the book together. DISCLAIMER: As with the first book, this second book might have gotten an extra star from me just because I'm friends with the author, but, what are friends for? And a four-star book is still a pretty darn good book. "As Life Moves On" is well worth checking out. Buy "As Life Moves On" now at Amazon.com. Click here. 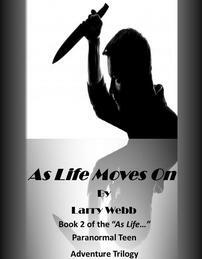 Buy "As Life Moves On" now at Barnes & Noble.com. Click here.